I have two montiors, both supports HDMI and VGA. However my GPU (EVGA RTX 2080 ti Black) only has 1 HDMI port with the rest DisplayPort or the USB-C. So I got myself a DisplayPort to HDMI cable and connected it to my second monitor. However I am getting no signal, the computer does not detect the connection but the second monitor does but without any image, is there any solution or must I get a new cable? Currently on the newest driver. What happens if you unplug the hdmi cable from the gpu and only leave the dp to hdmi cable connected? Interesting, only during BIOS/Splash/Startup do I get video with the HDMI cable unplugged, but once I get into the login the screen goes black and I have to reconnect the HDMI cable to see anything. Have you tried a different DP connector on the card? same effect, I only see the splash/BIOS when only the DP/HDMI is connected, and then loses connection once windows starts. Upon further testing, the DP to HDMI display also works in safe mode when the HDMI cable is not connected. Sounds like a driver problem. Did you use DDU before installing the card and/or updating drivers? 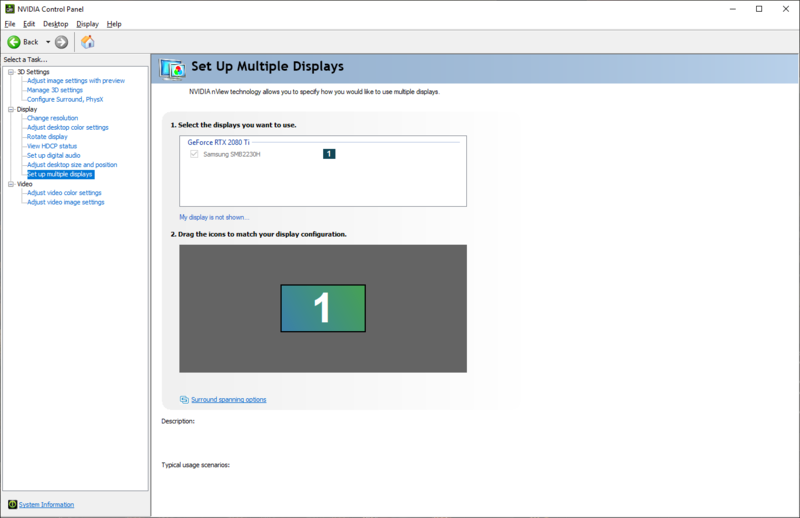 Sounds like you need to setup your monitors inside the nvidia control panel under the "setup multiple displays menu". Prob your adapter is incapable of the resolution being pushed threw it. That's why it shows the other bios/post screen/safe mode is using a Lower resolution. Bah.. your prob doing 1080 right? Older monitor with VGA as well. Yeah mess with multi monitor settings in the nvidia control panel.. maybe need to use windows advanced display properties first to enable the 2nd screen first? Try doing a bios reset. I don't see any other monitors except the one connected to HDMI at the moment. Time to try a different cable. I think I'm gonna try a new cable first. Try a new cable as stated. I would honestly just go with DP on all cables because sometimes the HDMI gets priority over DP, if you're trying to use a new high rez/hz screen as your main via DP. Than start off with the DP cable nearest to the top of the GPU and go your way down towards the PCIe. You could always switch around the DP cables to make the center main screen is your BIOS splash screen. Than just go into Nvidia Control Panel and make the appropriate changes on how you want your screens to be utilized. Alright, after buying a DP->HDMI as well as a USB-C->HDMI adaptors and trying both out successfully, I can conclude that it was the DP/HDMI cable that is faulty unfortunately. I wonder what I should do with this faulty cable. I wonder what I should do with this faulty cable. Throw it in the dumpster.